Animal research, which is performed by several laboratories around MIT, has emerged as a sensitive and difficult issue for both researchers and protesters alike. Brian N. Hubert G has been named the recipient of the seventh annual Lemelson-MIT Program $30,000 Student Prize. 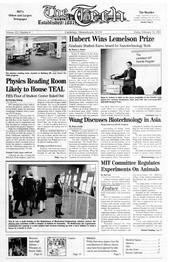 MIT administrators have indicated that the physics reading room will probably house the upcoming Technology Enabled Active Learning (TEAL) project. Institute Professor Daniel I. C. Wang ’59 spoke about the development of biotechnology industries in several Asian countries last night.